The Gobi Desert and Ulan Bator. It must have been the lack of motion that woke me up. 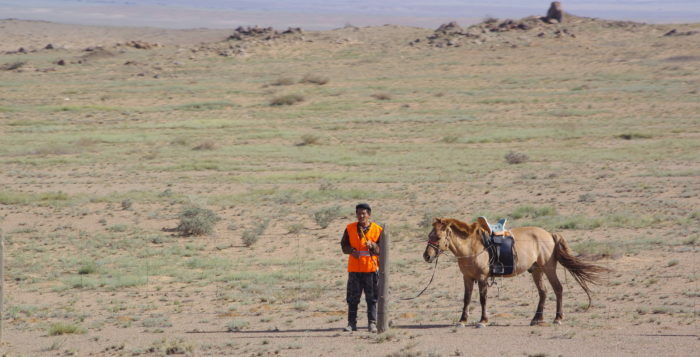 I didn’t know why were were stopped—there was no other train traffic—and then I heard someone passing by in the corridor saying it was the Gobi Desert and we were going to be stopped here for about a half hour. Furthermore, we were free to get off the train! And so I got a photo of our train, stopped in the middle of the Gobi Desert, with the sun up just enough to capture what still seems like an extraordinary moment . . . one of those times when you say to yourself, “Look around. Remember this.” It was not the first such moment on this trip; the first one had occurred back in Moscow when I found myself standing in Red Square. We’re in Mongolia now and there’s an amazing tradition of horsemanship here. Later in the day we saw five- and six-year-old kids racing their horses just for fun and with no adult supervision. This is a railroad worker, literally miles out in the middle of nowhere, with his transportation, presumably provided by the railroad. On the move again, no longer in the desert and headed for the Mongolian capital of Ulan Bator, we passed through what I thought was very beautiful country, appearing lush and green, with whole families living in yurts and makeshift fencing to contain some livestock and the small, wiry Mongolian horses. 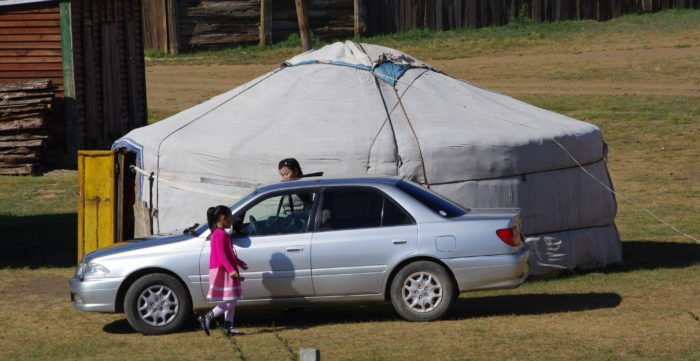 The closer we got to Ulan Bator, the more signs of civilization we saw. There was absolutely no mistaking what was happening here: the mom was taking her daughter to school and they were running behind schedule. A few hours later and three-quarter of a world away, the same scenario would be happening back on Maui, with my daughter and granddaughter. 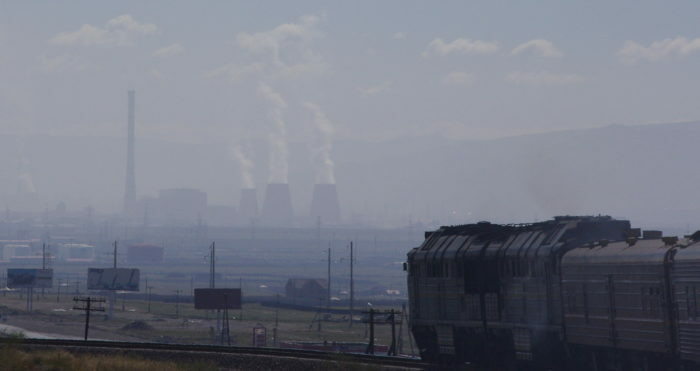 Ulan Bator is the coldest capital city in the world and, if you ask me, it’s also the smoggiest. Most of it comes from the huge power plants that help keep the city’s 3 million residents warm. It looks a lot worse in this photo than it really is … but it’s still pretty bad. From here we went to the Chinese border where we changed trains for the overnight ride to Beijing. And more smog. I’ll dig up a few more photos and post them in a few days. Previous Russia and Siberia Revisited. NextOnce Upon a Time in America . . .